This page is a place for odds and ends that may be of value to other garden railroaders. 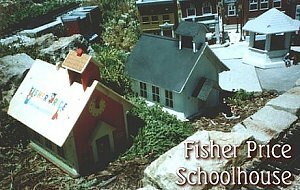 Initially this site was mostly graphic files I created for my own use to use on buildings I built or trashbashed, that is, created from non-models such as toys and bird feeders. Early versions of this page featured low-resolution graphics that could quickly be downloaded and printed on cheap printers. However, since more people have access to better networks, computers, and printers, I've replaced the graphics with commercial-grade graphic files. I've also added many new textures that hobbyists find useful, including rotten cedar shakes, flagstones, etc., as well as a few signs that look good around the train room or trainyard. Update for 2013! Large Scale Sticker Sheets Page! When we started this page, nearly everyone had dial-up, so we only put a few graphics per file. Otherwise it would take forever to download them. We also left most of the downloadable files in .jpg format so they would be easy to resize for your purposes (you can even do it in most word processors). But most folks can download 1-3 meg files now without having to start the download before they go to bed and hoping it finishes by morning. So for your convenience, we have crowded the most popular graphics from these pages onto a few sheets, so you can download them all at once. We've also added a large number of graphics from J. Powell that we had permission to use, but no good way to get to you until now. Our Sticker Sheets page gives you the details, as well as links to many other resources you can downoad. We have other sticker sheets planned, so please check back once in a while. Our traditional resource links are below, followed by links to other resources that you may find helpful. I have been stockpiling graphics to add to this page when I have opportunity. We are now adding an entirely new feature: High-resolution photographs of classic buildings and building fronts that you can print off and use to provide backgrounds on indoor railroads, especially shelf railroads. 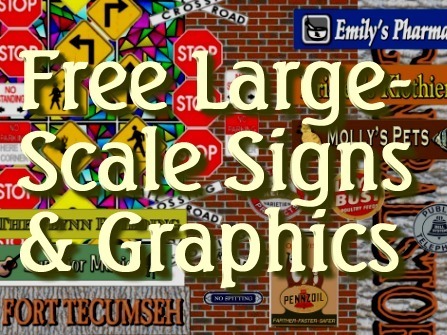 New for 2012: Celtic Storefronts - Souvenir graphics you can use on your railroad or village. While we were in Ireland, Paul took dozens of photos of buildings and textures that he plans to include on our resources pages. In this case, six building fronts from two Wicklow County towns have been cleaned up, squared up, and resized so you can print them out and use them right on your railroad or town. Though they have an Irish feel, they'd be at home in most North American settings, or even on an "Isle of Sodor" railroad. To see the new resources, please click the photo. This section replicates old-fashioned signage that you used to see on and around railroads. Today you can use them to remind people where they're allowed to go and where they're not allowed to spit. 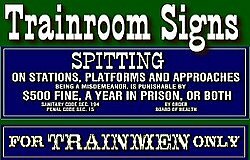 The Trainroom Signs page includes instructions for printing and preparing for use out of doors. 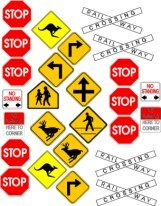 This section includes commercial quality signs and posters that you can resize and print to use on your railroad buildings and accessories. 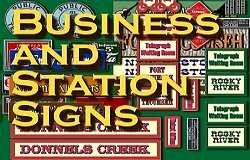 The Business and Station Signs page includes instructions for resizing and printing. We have also added a collection of miniature toy train posters has been added for use in store front windows, etc. This section includes downloadable "brick paper," flagstone patterns, and other commercial quality graphics you can resize and print to use for buildings and backgrounds. Folks with collectible villages can use the brick and stone pages for streets. 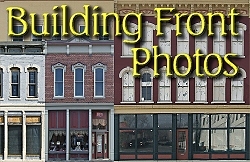 The Building Textures page includes instructions for resizing and printing. This feature on the Big Indoor Trains? site includes brick, shingle, siding, door and window patterns inspired by the tinplate buildings that Lionel and other companies made to go with their toy trains a century ago. Many of these have already been used in our Tribute to Tinplate? series, which has been embraced by toy train buffs. This section includes downloadable curtain and venetian blind patterns you can use to add color to a dull building or to camouflage a building's lack of interiors. Update for 2012 - I need to print some curtains on overhead projector film. To save media, I combined patterns on PDF pages that you can download free. 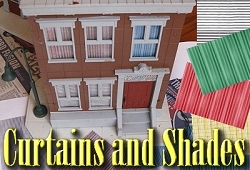 The Curtains and Shades page includes instructions for resizing and printing. 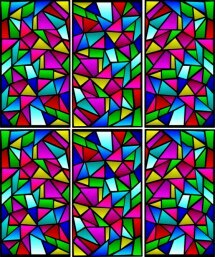 Stained Glass Windows (572K). 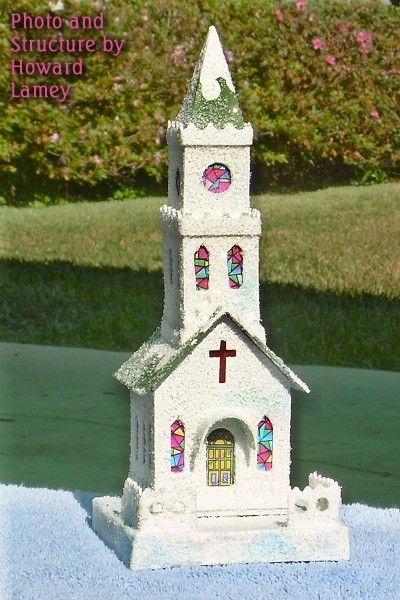 I made these up from a Corel-Draw clip-art file to use for a Fisher-Price schoolhouse I am converting into a church. I printed them on Hammermill Papers' "Invent-it" clear decal stock (not good for rolling stock details, but good for signs). Looks great; I mounted them behind clear plastic for additional protection, but the colors came out nice and rich and deep-looking. 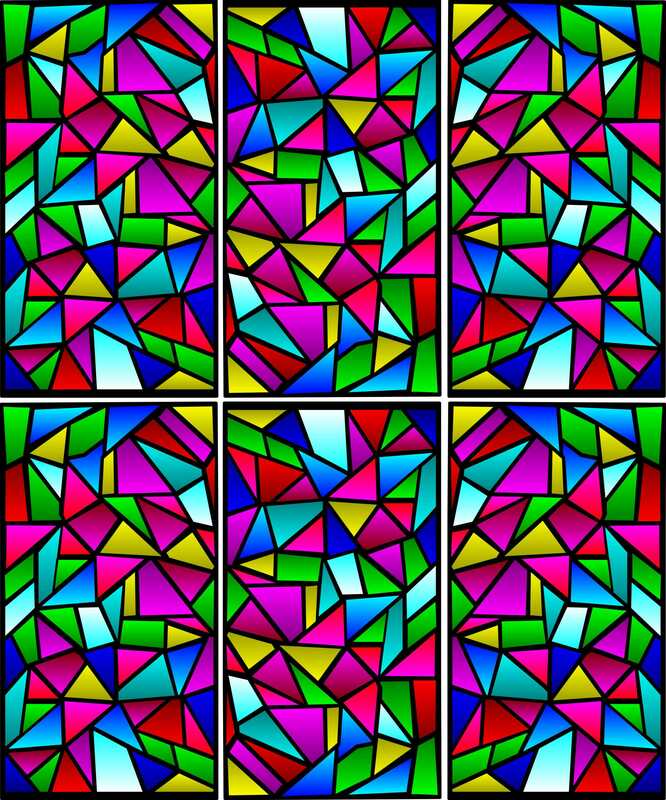 Since I posted these, lots of folks have used them, including professional sign companies who needed to make a client's full-sized windows look like stained glass. But one of the most interesting examples comes from Howard Lamey, of Jacksonville. One of Howard's hobbies is building cardboard "Christmas houses" that look like the ones we had around our train set growing up (and which became "cool" again in the early 2000s). To see a church he built using the stained-glass pattern, simply click on the thumbnail to the right). Howard tells me that it is 9" high and the base is 3 1/2" square, if that helps. Street Signs (752K) Using the Alps, I printed out a few of these on plastic stock, with the idea of cutting them out and gluing them on sticks. Okay, it isn't exactly a model railroading page, but we thought we would let you know about a great resource we're putting together for the Family Christmas Online web site. This page includes several color-coordinated antique-style "wrapping paper" patterns that will add color and charm to the simplest paper crafts. Or you could use one to wrap a small present if you forgot to get wrapping paper before Christmas eve. The Family Garden Trains "Where Do I Go From Here" page includes links to several sites that contain a lot of good information on Garden and Large Scale railroading. If there's something else you'd like to see here, I'm open to suggestions. Also if you have something you think is worth posting here, please contact us.